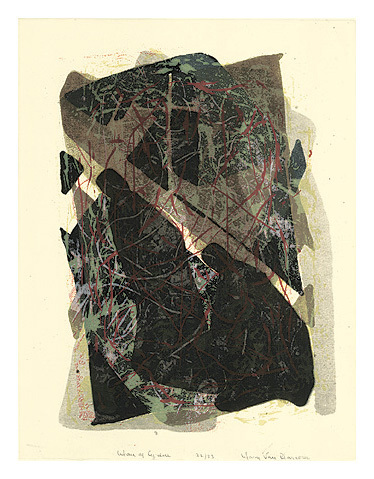 Painter, printmaker and craftsperson, Mary Van Blarcom was born in Newark, New Jersey and studied at Wellesley College. She was a member of the National Serigraph Society where she served on the board of trustees from 1945 throught 1952, and was 1st vice-president from 1949-51. She was also a memeber of the National Association of Women Artists, the Artists Equity Association, the American Color Print Society, the New Jersey Artists Association (Director), and Artists of Today. 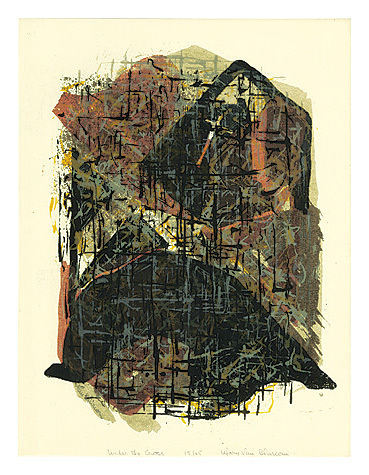 1945-47; Carnegie Institute, 1947; Serigraph Gallery, 1946, 1951 (solo); American Color Print Society, 1947-52; Newark Museum, 1947-48, 1951; California State Library, 1947, 1949; National Serigraph Society, 1949 (prize), 1950 (prize); University of Chile, 1950; New Jersey State Museum, 1950; Philadelphia Art Alliance, 1951; and the Main Gallery, NY, 1952. 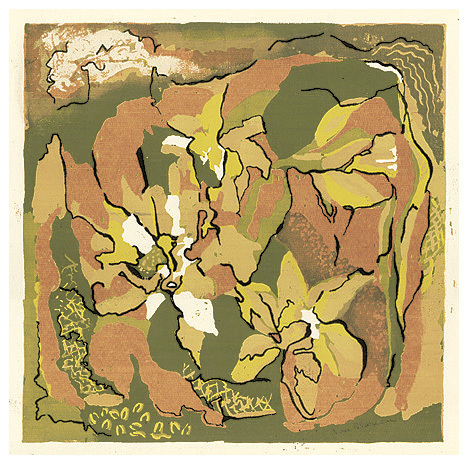 Van Blarcom's work is in the collections of the Newark Public Library, the U.S. Government; the American Association of University Women; New York Public Library; Tel-Aviv Museum, Alabama Polytechnic Institute, Princeton Print Club, Howard University and the U.S. State Department. Mary Van Blarcom died of cancer at the early age of 40, in Point Pleasant Beach, New Jersey. 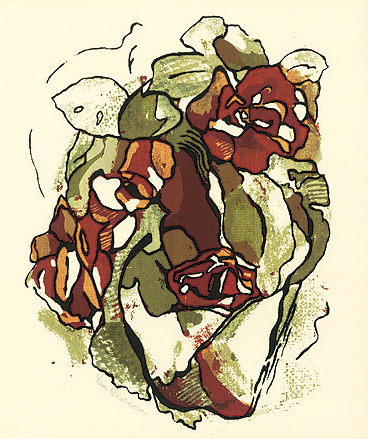 Corsage - - c.1944, Color Serigraph. Edition not stated. Signed in pencil in the image, bottom center. Image size 12 x 18 inches (305 x 457 mm); sheet size 15 x 22 inches (381 x 559 mm). A rich, painterly impression, with fresh colors, on heavy cream wove paper; full margins (1 3/8 to 2 1/8 inches). Brown paper tape hinge remains in the top left and right sheet corners; otherwise in excellent condition. 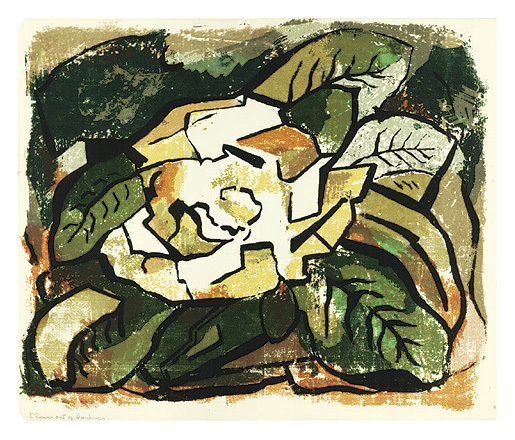 The Moon Is Like a Lemon - - c.1945, Color Serigraph. Edition not stated. Signed in pencil in the image, lower right; signed in the screen, lower left. Annotated Mary Van Blarcom 189 Hydefield Lane Nutley, NJ Price $12 edition35 colors11 Title "The Moon Is Like a Lemon" please do not cut title abbreviate my name if you need to in pencil, verso. Image size 14 x 18 1/4 inches (356 x 464 mm); sheet size 17 1/2 x 22 7/8 inches (445 x 581 mm). A rich, painterly impression, with fresh colors, on cream laid paper; full margins (1 1/8 to 2 3/4 inches). Brown paper tape hinge remains in the top left and right sheet corners; a repaired tear in the bottom right sheet corner, well away from the image; otherwise in very good condition. 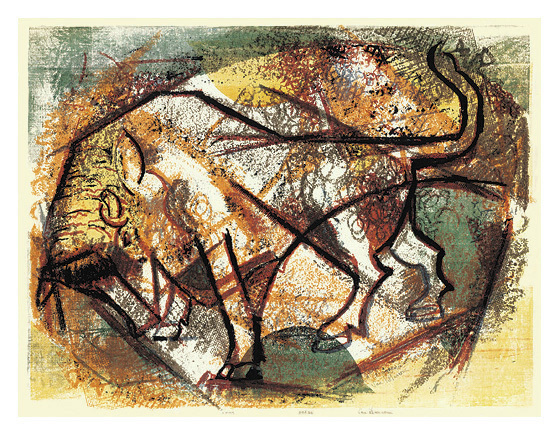 Toros - - c.1945, Color Serigraph. Edition 30. Signed, titled and numbered 30/30 in pencil. Image size 18 3/8 x 24 3/8 inches (467 x 619 mm); sheet size 19 x 25 1/8 inches (483 x 638 mm). A rich, painterly impression, with fresh colors, on cream laid paper; full margins (1/4 to 3/8 inch), in excellent condition. Under the Cross - - c.1945, Color Serigraph. Edition 45. Signed, titled and numbered 18/45 in pencil, bottom sheet edge. Image size 11 1/8 x 8 3/8 inches (283 x 213 mm); sheet size 12 1/2 x 9 1/2 inches (318 x 241 mm). A rich, painterly impression, with fresh colors, on cream laid paper; full margins (3/8 to 3/4 inch), in excellent condition. Man of Cyrene - - c.1945, Color Serigraph. Edition 33. Signed, titled and numbered 32/33 in pencil, bottom sheet edge. Image size 10 7/8 x 7 7/8 inches (276 x 200 mm); sheet size 12 1/2 x 9 1/2 inches (318 x 241 mm). A rich, painterly impression, with fresh colors, on cream laid paper; full margins (9/16 to 1 1/8 inches), in excellent condition. 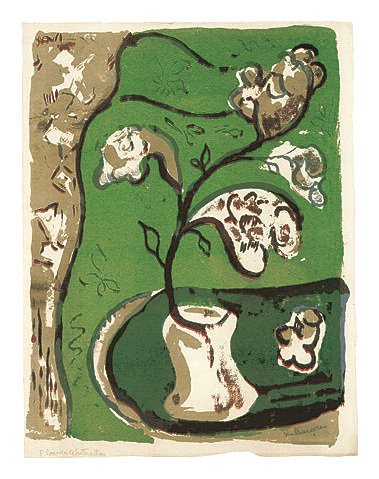 Surgent Spring - - c.1945, Color Serigraph. Edition not stated. Signed in pencil in the image, lower right. Titled in pencil, bottom left sheet corner. Image size 24 1/4 x 11 7/8 inches (616 x 302 mm); sheet size 25 1/8 x 19 inches (638 x 483 mm). A rich, painterly impression, with fresh colors, on cream laid paper; full margins (3/8 to 3 1/2 inches), in excellent condition. 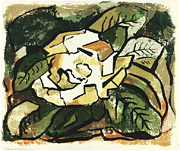 Flower Abstraction - - c.1945, Color Serigraph. Image size 12 1/4 x 9 1/2 inches (311 x 241 mm); sheet size 12 3/4 x 9 3/4 inches (324 x 248 mm). A rich, painterly impression, with fresh colors, on cream laid paper; full margins (1/16 to 1/4 inch), in excellent condition. 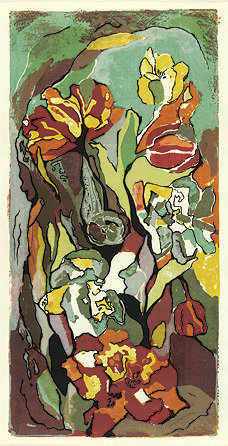 Lilies - - c.1945, Color Serigraph. Edition not stated. Signed in pencil in the image, lower left. Titled in pencil, bottom left sheet corner. Image size 9 5/8 x 12 9/16 inches (244 x 319 mm); sheet size 10 3/8 x 14 inches (264 x 356 mm). 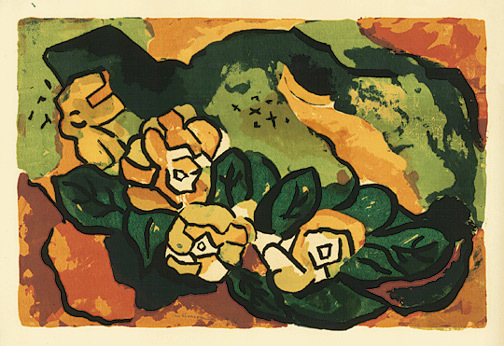 Gardenias - - c.1945, Color Serigraph. Edition not stated. Signed Van B in pencil in the image, lower right. Titled in pencil, bottom left sheet corner. Image size 6 x 8 3/8 inches (152 x 213 mm); sheet size 6 7/8 x 10 1/4 inches (175 x 260 mm). A rich, painterly impression, with fresh colors, on cream wove paper; full margins (5/16 to 1 1/16 inches), in excellent condition. 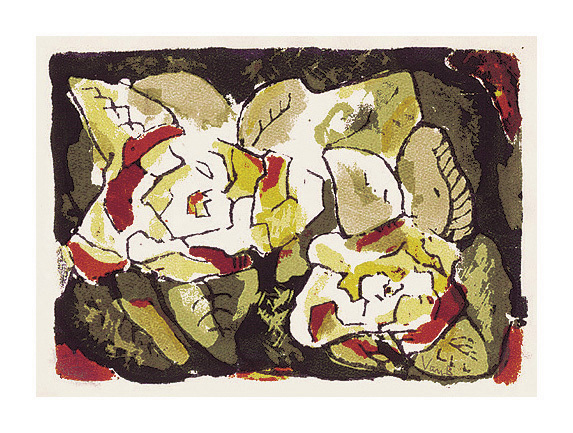 Crown of Roses - - c.1945, Color Serigraph. Image size 8 13/16 x 12 11/16 inches (224 x 322 mm); sheet size 9 1/2 x 8 5/16 inches (241 x 211 mm). A rich, painterly impression, with fresh colors, on cream laid paper; full margins (3/8 to 7/8 inch), in excellent condition. 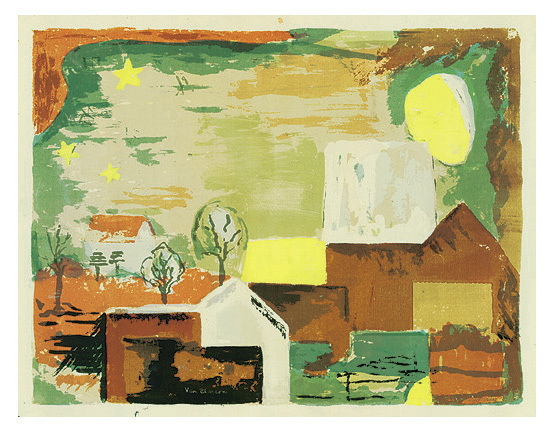 China Spring - - c.1945, Color Serigraph. Image size 10 3/4 x 10 3/4 inches (273 x 273 mm); sheet size 11 15/16 x 12 5/8 inches (303 x 321 mm). A rich, painterly impression, with fresh colors, on cream laid paper; full margins (9/16 x 15/16 inch), in excellent condition. 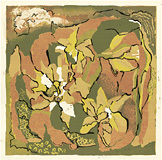 Flower Out of Darkness - - c.1945, Color Serigraph. Image size 13 1/2 x 16 1/8 inches (343 x 410 mm); sheet size 13 13/16 x 16 5/8 inches (351 x 422 mm). 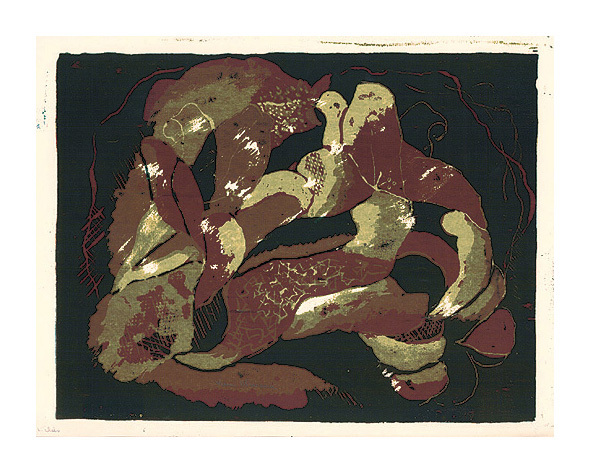 A rich, painterly impression, with fresh colors, on cream wove paper, printing to the sheet edges, in excellent condition.